Use this to open and close your garage remotely from any device. After spending over 20 hours wiring and rewiring garage-door openers, opening and closing the doors with our smartphones and our voices, and controlling them through smartphone apps and home-automation routines, we found that the Chamberlain MyQ Garage (MYQ-G0301) is the best smart garage-door controller for most people. 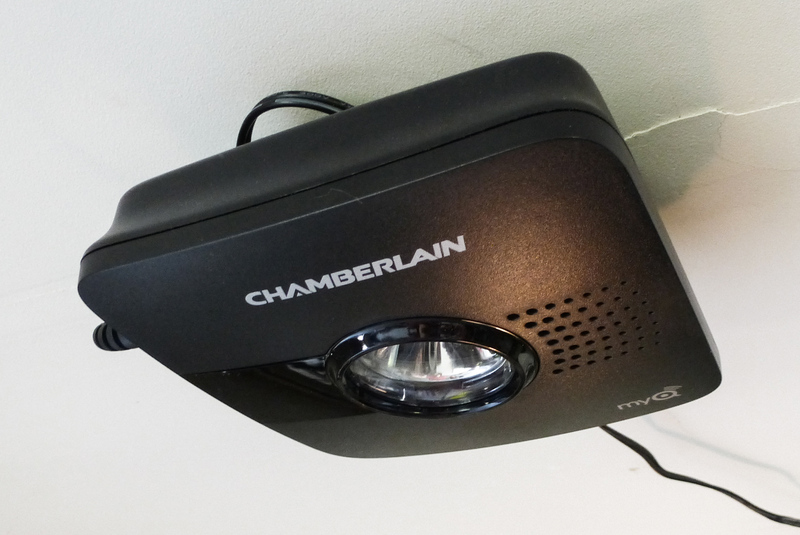 It was the easiest and quickest to install of all the controllers we tested, it's among the simplest to set up and use, and it's compatible with the most garage doors, thanks to the huge popularity of Chamberlain and LiftMaster products in homes across the country. A smart garage-door controller is an add-on that works with your existing garage-door opener, letting you control the door from anywhere through an app on your smartphone, tablet, or computer. It does not replace your existing garage-door opener or prevent other devices that open your garage door—such as visor clips, push buttons, and keypads—from working as before. A smart garage-door controller is an excellent security and access tool for your home, vacation home, or rental property. An estimated 71 percent of American homeowners use the garage door as the main entry point to their home, and being able to open and close it remotely is very convenient. 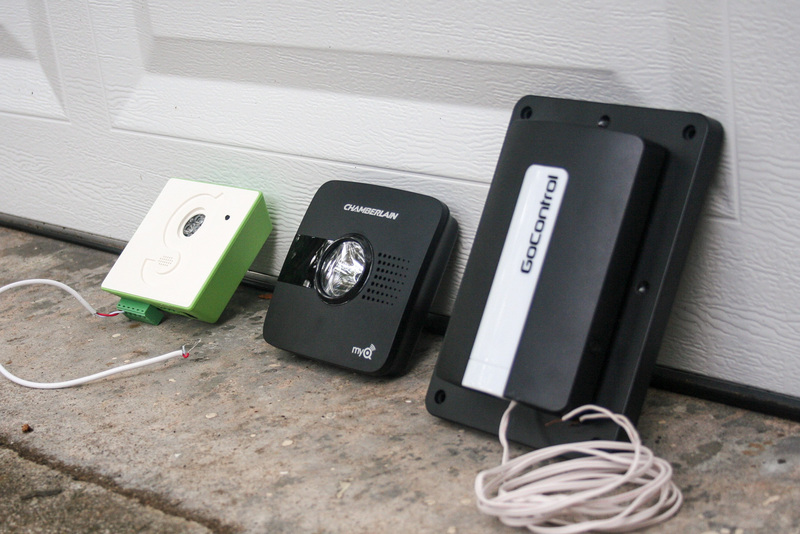 You'll also find a few Bluetooth smart garage-door openers, including gLink and SecuRemote. But Bluetooth's range is limited, so with these controllers you can control your garage door only from within or near your home, as you do with your regular garage-door remote. All of the smart garage-door controllers we tested performed well in opening and closing the doors remotely, offered notifications if we left the door open, and allowed us to close the door through the companion app. We focused our testing on how easy each controller was to work with, both in installation and setup and in everyday use. Not all smart garage-door controllers will work with all garage-door openers. And contrary to what you might normally expect with technology, the newer your door opener is, the less likely it is to work with the majority of replacement garage-door controllers. 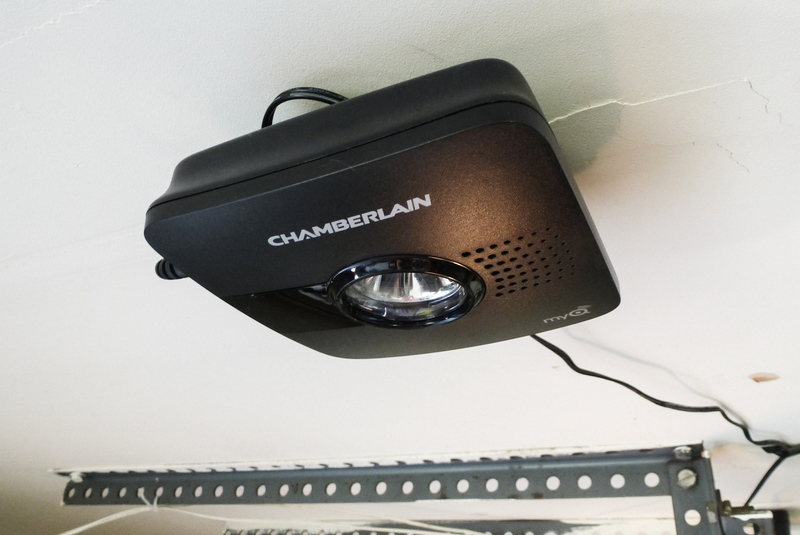 The Chamberlain MyQ Garage (MYQ-G0301) is the leading smart garage-door controller available, largely due to the huge popularity of Chamberlain garage-door openers (and those sold by its professional install brand, LiftMaster). The MyQ was the first smart garage-door controller to be manufactured, and it's one of the simplest smart-home devices to install and set up. If you are looking for a way to control your garage door remotely and check on its status, and would like integration with major smart-home systems such as HomeKit, Wink, IFTTT, and Google, the MyQ Garage is the best option. In our tests, the install took under 15 minutes, with the only pain being drilling some screws into the garage ceiling for the mounting bracket. First, we mounted the door sensor to the door itself, using the included Velcro strips (you can use screws if you prefer), after which we attached the bracket for the main unit to the ceiling (near the door and near an outlet) using screws. 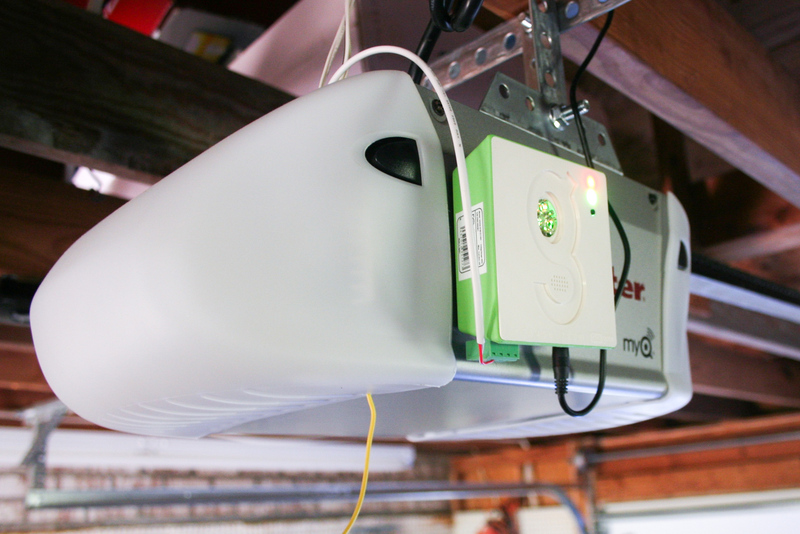 We then slid the MyQ Garage into the bracket, plugged in the power supply, and proceeded to connect it to Wi-Fi with a smartphone and the free MyQ app. It really is a plug-and-play device, and it's the only model we tested that doesn't require any wiring, so you have no need to mess with your breaker. You will need a smartphone, Android or iOS, to set it up, and if you have poor Wi-Fi reception in your garage, you may need to purchase an extender, but the MyQ Garage does a pretty good job with a weak signal. We contend that anyone can set up the MyQ Garage in 15 minutes, as long as they're handy with a drill. Once installed, the MyQ Garage lets you open and close the door through its app from wherever you are.The device also emits warning beeps and flashes an LED light when the door has been triggered to close remotely (but not when opened). 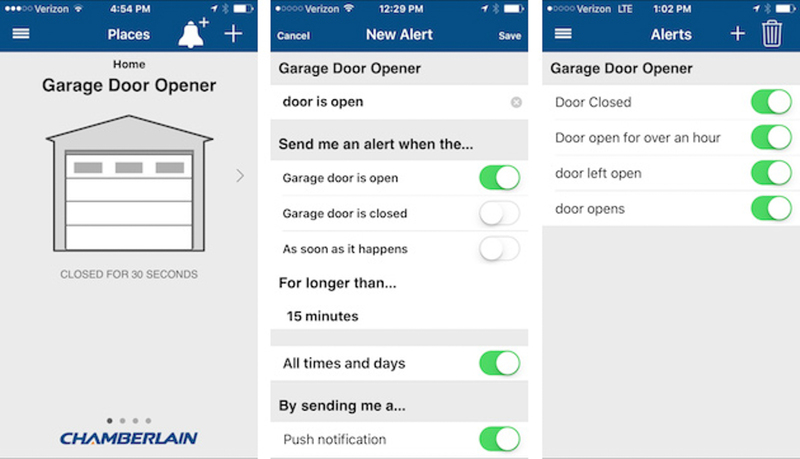 This feature is important for alerting someone in the garage when it is being closed remotely, and is a UL requirement for "unattended operation" of garage doors. Within the app you can create as many customized alerts as you want for when the door is open and closed, and when you are alerted about it via push notification or email. Two especially useful alerts can notify you if the door has been left open for longer than a specified amount of time and inform you of the status at a particular time—say, between 7 p.m. and midnight. 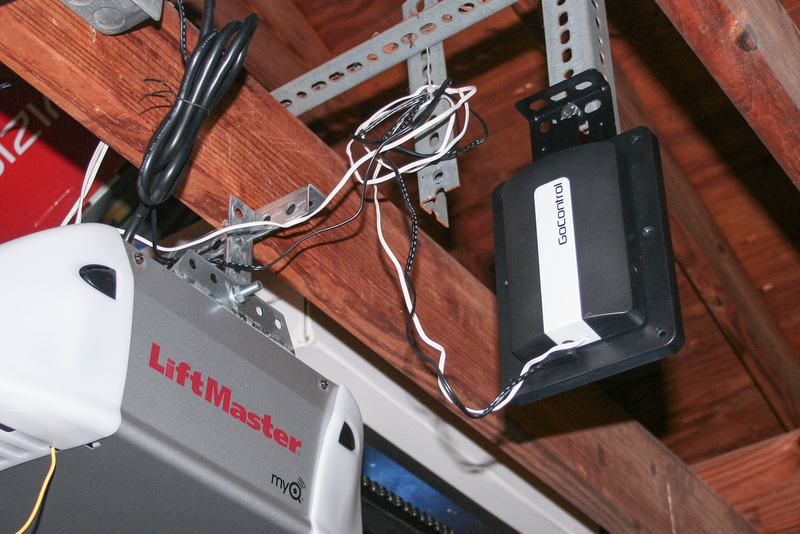 Though the MyQ Garage will suit most people very well, if you have an older Chamberlain/LiftMaster door opener, or a different brand, and you're looking for a bit more functionality than just opening and closing remotely, consider the Gogogate2. It is the most feature-packed garage-door controller we tested. It also has the best app interface, keeping you fully informed about what's going on in your garage courtesy of clear, bright graphics, a temperature reading, and even a live visual of your garage door (if you choose to add an IP camera to your setup). And as the name implies, it also works with powered gates. The GoControl/Linear Z-Wave Garage Door Opener Remote Controller may have the least catchy name ever, but it does what it says on the box very well and with no restrictions, if you choose the right home-automation system to pair it with. It's a great choice for a smart-home enthusiast who enjoys setting up routines and integrating the control of their garage door with all their other Z-Wave smart-home devices (of which there are many—here's a PDF list of some compatible GoControl ones). It is not a good choice if you just want to open and close your garage door remotely, as you need a separate home-automation hub for it to function, and no stand-alone app will work with the GoControl device by itself.